Last year, we ventured from Portland, Oregon to Puerto Montt by Public Transit! We had to make it to the South of Chile for Mom’s Christmas Barbecue! All throughout Latin America, we stopped at weekly Sunday Parkways and talked with bike businesses as we rode various transit South. We found some great mobility ideas and innovations in unexpected places! Global Greenways shares our stories of cycling culture, bike fun, Sunday Parkways, Bicitaxi/Pedicab drivers, Roller Derby, transit, and of bike businesses in the Americas. The route of our 2010 investigations took us down the Pacific Coast to the South of Chile. As we ventured from 45°N to 41°S we rode public buses, commuter trains, in the back of pickup trucks, boats, tuktuks, cars, pedicabs, chicken buses with plasma screen TVs, tricycles, golf carts called ‘pneumonias’, taxis, collectivos, micros, “euro buses,” bicycles, semitrucks, trolleys, diesel one car trains, bus rapid transit, metrocable cars, subways, elevated light rail, & electric trains! But mostly, we walked a lot and rode buses for 7000 miles. 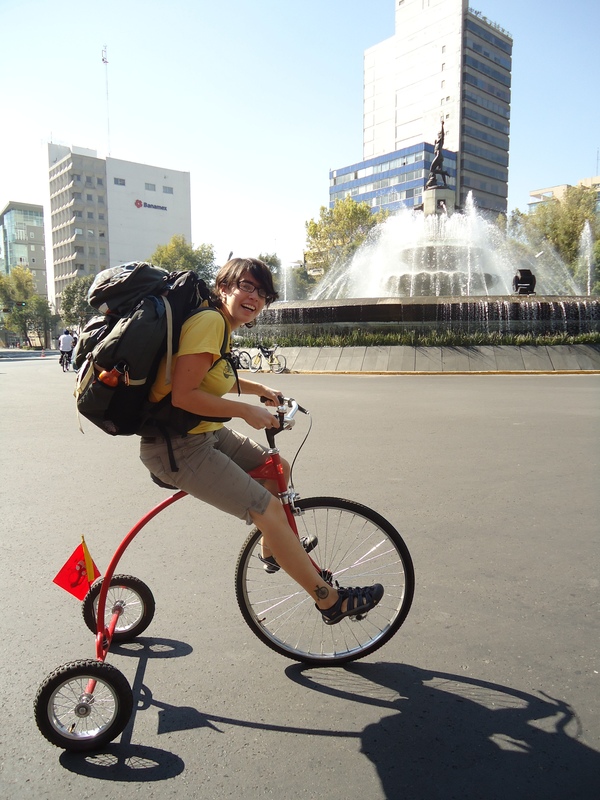 We will blog the experiences and lessons we learned from Latin American cycling and active transport activists. They showed us that Latin American social movements for urban mobility and public spaces have as many lessons for urban design as traditional beacons of sustainability such as Copenhagen or Portland! In many of the Latin American countries visited, very innovative practices were being implemented. We saw experimental Cycletracks on downtown Mexico City streets, Bus Rapid Transit systems in Quito, Huge Sunday Parkways in Guadalajara, and Aerial Trams as mass transit in Medellin. These were some of the unique mobility ideas that we experienced en route. Our travels this year will begin in Colombia with Sunday Parkways and Roller Derby.